Commonly used for: 0% APR, No Annual Fee, Rewards. Citi’s newest addition to their credit card line-up is a solid card for those looking to maximize rewards on everyday spending. If you’re a current Citi cardholder, this no annual fee credit card would also make a great complementary card to boost your ThankYou Points earning potential. The Citi Rewards+ Card offers 2x ThankYou Points at supermarkets and gas stations on up to $6,000 in combined purchases each year, plus 1x ThankYou Points on all other purchases. There’s no annual fee, and you can take advantage of a 12-month introductory offer. You can also earn 15,000 bonus ThankYou points after spending a modest $1,000 within the first three months. While that may not sound like a card to write home about, Citi has thrown in a few unique features that add a lot of value. The Rewards+ Card rounds up all of your rewards to the nearest 10 points, and you can get 10% Points back for the first 100,000 Points you redeem each year. The Rewards+ Card also comes with access to Citi Private Pass, where you can purchase presale tickets and VIP experiences for events throughout the year, and Citi Concierge, which is considered one of the best concierge services among top credit card issuers. This card offers a simple way to maximize rewards on smaller purchases. The round-up feature is something no other card currently offers, and this perk alone can make the card a valuable addition to your wallet. The 15,000-point sign-up bonus is nothing to brag about, but that is the trade-off for no annual fee. Both beginners and Citi loyalists can benefit from the Rewards+, making it a decently versatile card. Credit card newbies can earn a sizeable amount of rewards without paying an annual fee, while experts with top-tier Citi cards can pair the Rewards+ with others to maximize value. The Citi ThankYou Rewards program got a much-needed upgrade in 2018, adding a lot of flexibility in their cards’ earning potentials and redemption options. You can redeem your ThankYou Points as a statement credit, cash-back, gift cards, travel rewards and more. Plus, you can Shop with Points online at Amazon, Expedia, LiveNation and on other partner sites. However, you’ll still get the most value on travel redemptions. 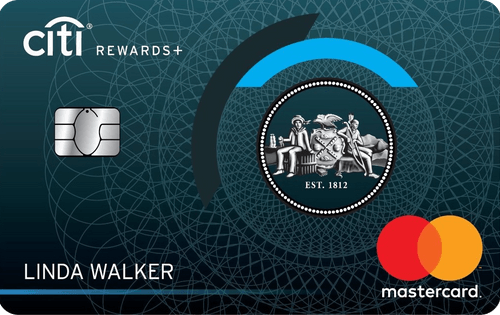 The main caveat to the card is that points earned are only considered “basic” Citi ThankYou Points, which hinders some of your redemption flexibility. If you don’t also have the Citi Prestige Card or Citi Premier Card, you are unable to transfer points to travel partners (with the exception of JetBlue). Considering you get the most value from transferring points, this is a major drawback for those who don’t have other Citi cards. Something else to consider is the stipulations attached to earning 2x points. There is a $6,000 annual cap for the combined categories, and many purchases you might assume qualify as “supermarkets” or “gas stations” don’t because of their merchant codes. Warehouse clubs, wholesale clubs and superstores might not qualify for 2x purchases. This isn’t a Citi-specific issue – many credit cards with bonus categories cause frustrations due to merchant codes, but it is something to keep in mind before applying for the card. Points round up to the nearest 10 on every purchase (meaning a $2 candy bar earns 10 points instead of two). 0% APR on balance transfers and new purchases for 12 months (15.74-25.74% variable APR after). You’ll receive 10% points back for the first 100,000 ThankYou Points you redeem each year. Access to both Citi Private Pass and Citi Concierge. The 15,000 sign-up bonus does not add a lot of value to the card, and you are ineligible to receive it if you’ve earned a Citi sign-up bonus within the past 24 months. The ThankYou Points earned with this card are considered “basic” and cannot be transferred to most travel partners for maximum redemption value. There is a 3% foreign transaction fee. The Citi Rewards+ Card has a modest 15,000-point sign-up bonus, which is worth $150 when redeemed for travel. It’s not a spectacular offer, but that’s to be expected with a no annual fee credit card. Remember that Citi only allows cardholders to earn one sign-up bonus every 24 months for select credit cards. If you have recently earned a sign-up bonus for another Citi card, you might not be eligible for this one. While Citi has made some significant improvements to ThankYou Rewards, the worth of program really depends on which Citi cards you have in your wallet. If you’re using the Citi Rewards+ Card by itself, your points don’t hold nearly as much value as other rewards programs or cash back structures. “Basic” ThankYou points are only worth one cent each, and you don’t have the option to transfer points to Citi’s travel partners with the exception of JetBlue (which offers a lackluster transfer offer). On the other hand, if you are looking to pair this card with your Citi Prestige or Premier card, rewards are worth significantly more. You can then transfer points earned with your Citi Rewards+ Card to your other accounts, where they are worth 1.25 cents per ThankYou Point when redeemed through the Citi Travel Portal. Additionally, you’ll be able to utilize Citi’s numerous transfer partners, which can further maximize point values. Introductory 0% APR for 12 months for new purchases and balance transfers (15.74-25.74% variable APR after). Balance transfer fee of 3% or $5, whichever is greater. See all Rates & Fees. The card was built for everyday spending. The ThankYou Points earned with every purchase are rounded up to the nearest 10, which can seriously increase the rewards value of everyday small purchases. Your morning $4 coffee fix on the way into work is worth 10 Points. If you get that same coffee order every day, that’s 3,650 ThankYou Points by the end of the year compared to less than 3,000 points with another card that offers 2x points on dining. Beginners can certainly utilize the card to earn rewards, but those willing put in a little more time and effort into playing points game will get the most out of the card. If you’re looking to really maximize how much value you get from the Citi Rewards+ Card, you need to use it strategically with other Citi credit cards. Premier and Prestige cardholders have the most to gain from opening a Rewards+ Card. Keeping in mind that the Prestige isn’t currently accepting new applications, we’ve broken down how to get the most bang for your buck by pairing the Citi Rewards+ and Premier cards. Use the Premier on travel (including gas), dining and entertainment purchases to utilize the 3x points categories and use the Rewards+ on basically everything else. With that unique round-up feature, you can quickly rack up points on small, everyday purchases. Once you’re ready to cash out your ThankYou Points, transfer all of your Rewards+ earnings over to your Citi Premier. Then use your Citi Premier card to book travel. The two best options for redeeming travel are to book through the Citi Travel Portal or transfer points to a travel partner. You’ll get 1.25 cents per ThankYou point when you book through Citi, but transfer partners like Singapore KrisFlyer, Avianca LifeMiles, Virgin Atlantic and Etihad Guest can offer even more value for your ThankYou Points.